FORMER prime minister Najib Razak now faces three new charges of money laundering in relation to a former subsidiary of 1Malaysia Development Bhd (1MDB). Najib was charged today at the Kuala Lumpur Sessions Court under Section 4(1) the Anti-Money Laundering, Anti-Terrorism Financing and Proceeds of Unlawful Activities Act 2001. Each charge carries a maximum fine of RM5 million, imprisonment of up to 15 years or both upon conviction. He now faces a total of seven charges, the earlier four on July 4 being three counts of criminal breach of trust and one count of misusing his position under the Malaysian Anti-Corruption Commission Act. Kuala Lumpur Sessions Court judge Azura Alwi agreed to transfer the case to the high court, where a plea will be recorded today. Deputy public prosecutor Hanafiah Zakaria requested that all the charges be heard together, to which Azura replied that the application be made at the high court. Najib, wearing a blue suit, appeared calm as he sat in the dock. Present at the public gallery were his children, Noorashman and Nooryana Najwa. No supporters were allowed into the courtroom. Najib arrived just before 9am in a Toyota Vellfire with some two dozen supporters greeting him. Security is tight with several hundred police officers stationed throughout the court. 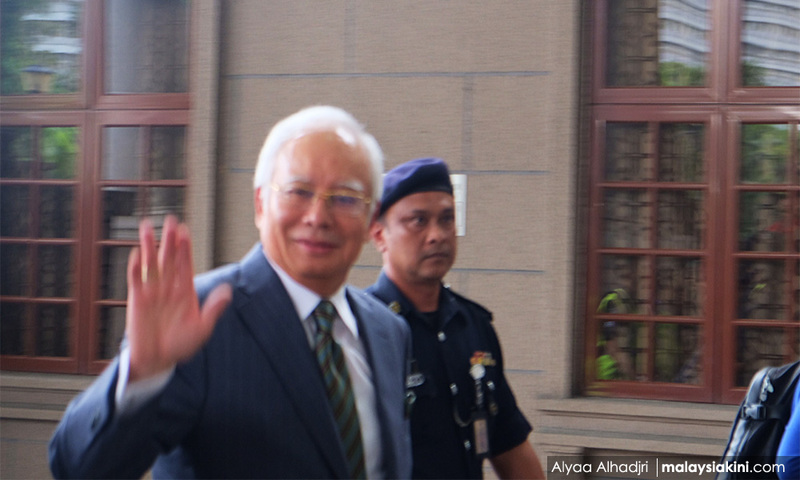 Today’s charges were in relation to his previous four charges, in which prosecutors accused Najib of misusing his position as a government official to accept a RM42 million bribe as an inducement to provide a sovereign guarantee on behalf of the Malaysian government for a RM4 billion loan from the Retirement Fund Inc to SRC International Sdn Bhd. SRC International was formerly a subsidiary of 1MDB, the state investment fund established by Najib when he became prime minister in 2009. 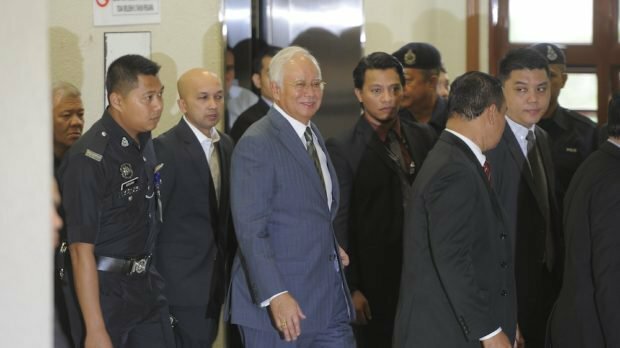 KUALA LUMPUR, Aug 8 — Datuk Seri Najib Razak claimed trial today when faced with three counts of laundering a total of RM42 million. Najib, 65, pleaded not guilty before High Court judge Datuk Azman Abdullah. The charges under Section 4(1) of the Anti-Money-Laundering, Anti-Terrorism Financing and Proceeds of Unlawful Activities Act 2002 (AMLATFPUAA) were initially read out to Najib at the Sessions Court before judge Azura Alwi earlier this morning. He was charged with three counts of money laundering, with the first count involving RM27 million, the second count involving RM5 million and the third count involving RM10 million. The Section 4(1) offence is punishable by a maximum 15-year jail term and a fine of RM5 million or a minimum five times of the value of the unlawful proceeds at the time the offence was committed, depending on whichever sum is higher. Previously on July 4, Najib was charged and claimed trial to three counts of criminal breach of trust and another charge of power abuse over RM42 million of funds said to belong to the former 1MDB unit. Under Section 409 of the Penal Code, which covers the offence of criminal breach of trust by a public servant over property he is entrusted with or has control over, the penalty is a jail term of between two years to 20 years and whipping and fine. KUALA LUMPUR – Datuk Seri Najib Razak arrived at the Jalan Duta Court Complex here at 8.50am today in his white Toyota Vellfire, escorted by police outriders. The former prime minister is expected to face three additional charges of money laundering in connection with the financial misappropriation of sovereign wealth fund 1Malaysia Development Berhad (1MDB). Dressed in a grey-blue suit and a white shirt, Najib stepped out of the Toyota MPV with a smile and waved to the crowd of journalists and photographers with their flashing cameras. He was accompanied by youngest son Norashman Najib, daughter Nooryana Najwa Najib and her husband Daniyar Kessibayev. Najib was summoned yesterday by the Malaysian Anti-Corruption Commission to have a “caution statement” recorded, a formality for an accused party in cases involving money laundering. On July 4, the Pekan MP who was also formerly finance minister, claimed trial on three counts of criminal breach of trust and another charge of power abuse linked to SRC International Sdn Bhd, a former subsidiary of 1MDB. 8.55am: Rosmah Mansor’s lawyers, K Kumaraendran and Geethan Ram Vincent, walk into the courtroom. They are here to hold a watching brief for the wife of the former premier. Also in court include the prosecution team, led by Attorney-General’s Chambers Trial and Appeals division head Mohd Hanafiah Zakaria, his deputy Ishak Mohd Yusoff, DPP Manoj Kurup as well as other senior officials. A number of MACC officials are also present. Lawyer Muhammad Shafee Abdullah and his defence team have yet to arrive. 8.45am: Najib arrives at the Kuala Lumpur court complex in a white Toyota Vellfire. Seen accompanying him were his children Nooryana Najwa and Noorashman. Najib appears calm as he waved to his supporters and media. He will first go up to the Sessions Court to face additional SRC International-linked charges before taken to the High Court.